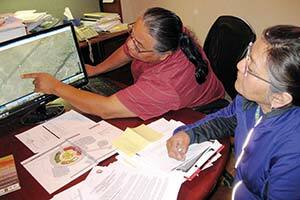 Shonto Community Governance Manager Robert K. Black Jr. and President Elizabeth Whitethorne-Benally look at a satellite view of Shonto at the administration building. Shonto was one of the very first chapters to become certified under the Local Governance Act of 1998. The president of Shonto Community Governance is an artist, which means that in Shonto, aesthetics rule. And as you look around this stunning, canyon-veined chapter, you can only breathe a sigh of relief for that. Here is a chapter (more accurately, a community governance since it adopted an alternative form of government in 2008, but we'll use "chapter" for consistency) that knows what it has and wants to preserve it. "I think it's because we've all lived somewhere else," mused President Elizabeth Whitethorne-Benally. "We came back because we missed the quiet." They've also seen places that have been preserved, and places that have been ruined, and they know they want Shonto to be one of the former. As a result, this very remote chapter is ironically progressive: committed to green building, growing its own food, alternative energy, and not having wires running all over the place if it can help it. "We're Navajo hippies here," laughed Community Manager Robert K. Black Jr.